When we were a newlywed couple and looked at our house we thought it was perfect. Six years and three kids later we are busting at the seams. We have no plans to move and we remind ourselves that when the kids move out this will once again be the perfect size house for us. Until then we will keep it full of love (and dust bunnies). This year we are in charge of my husband's side of the family's Christmas party. We like to entertain and we love to see family so we are looking forward to it. However, it leads to the problem of not only where will we put the people but where will we put the Christmas tree? Our living room is tight just with couches never mind a tree. 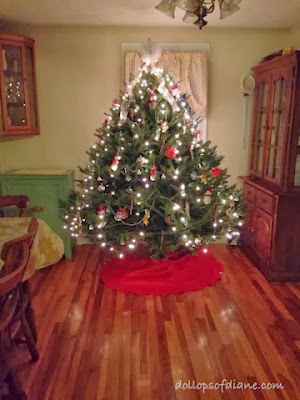 And even when we pick the smallest tree in the lot, it's still big in our house. So this year we went for something new - we moved our table and put our tree up in the dining room. We figure that will give more room for people to mingle in the living room and people generally don't hang out in the dining room anyway. Once I got over the fact that it's kind of ridiculous to have it there I actually kind of like it. The kids and I spend a lot of time in there since that's where we eat, color, do crafts, etc so it's nice to see it sparkling. Henry also said he's going to leave arrows from the fireplace to the dining room so Santa knows where to leave the presents. So we've got that covered.